For access to the lab, or for any general training, please contact the lab leader Dr Konstantinos Dimos, or their deputy Dr Bin Bao. For training on any of the equipment, please contact the Principal User or their deputy for the listed equipment. It combines a patented advanced drag cup motor, a second generation magnetic bearing, force rebalance transducer (FRT), and the new patent-pending True Position Sensor (TPS) in a single-head Hybrid rheometer. The DHR has unprecedented performance specification and delivers unsurpassed direct strain control, direct stress control, and normal force measurement accuracy. The DHR features all popular TA innovations including patented Smart SwapTM geometries and the widest range of Smart Swap temperature systems and accessories commercially available. The result is the most advanced, versatile rheometer platform imaginable. Advanced printing/coating system enabling accurate single and multilayer printing/coating of functional inks on flexible substrates. Designed to explore various possibilities and combinations of coating and printing with a precision of <20 µm in one machine. Easily and rapid exchangeable modules. Optical alignment system (optional). 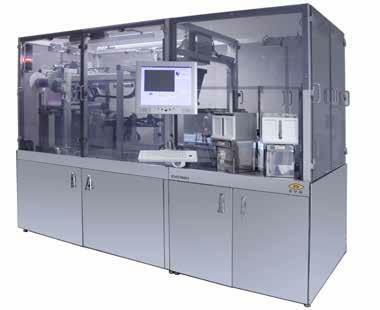 Measuring software, low ink consumption, 2 ml is sufficient for reproducible print (gravure/flexo). Customized printing forms. Chambered and open doctor blades. CeraPrinter X-Serie is a TurnKey Materials Deposition Inkjet tool for process development in Printed Electronics and Smart 3D Printing. Thanks to its patented rotative head-holder “plug and play”, full curing area, in-situ characterisation devices and exclusive software suite, CeraPrinter X-Serie is a perfect “all inclusive” tool to enable advanced inkjet process development. Reproducible temperature and climate tests can be performed directly at your workplace. This is possible with the WTL and WKL chambers of Weiss. This series was specifically developed for use in laboratories. Compact dimensions – considerable intrinsic values. Logitech’s CMP system offers nanometer level metarial removal capabilities on either individual die or wafers up to 200mm diameter. 3 mass flow controllers: 2 air (to give dry and wet air) and 1 gas, with a valve system to distribute gas mixture flow. a thermoregulated humidifier, to provide 100% wet mixture. a thermoregulated condenser to eliminate extra humidity. This allows maximum flexibility on preparing gas flows at a given concentration, humidity and temperature. With these parameters , the control program provides complete automatic sequences to verify all test in conformity with CEI norms. Computer Controlled Mass Spectrometer: Complete feedback on gas concentration is obtained by a computer-controlled mass spectrometer. Software PPT430 allows constant monitoring of cell contents, showing actual system concentration of gas. It is also possible to log data on disk , filling in reports on system activity. A special Close Source allows good readings even at low concentrations (a few PPM) of gas mixture (like CO, CH4, C4H10, and so on). Three independent test cells, each with its own sensors to monitor constantly pressure, temperature, relative humidity and flow speed. Microprocessor program is used to control every valve and to calculate gas flows and gas mixtures at desired concentration, humidity and temperature. Total control of dry and wet flows permits to obtain specified relative humidity value. Mass spectrometer to monitor actual gas concentrations. The Q20 is a cost-effective general purpose DSC that gives accurate and reproducible data. The Q20 can be equipped with a 50-position autosampler (Auto Q20) that provides a high-throughput platform for basic DSC experiments, with performance comparable to competitive research-grade instruments.